Household appliances never seem to break down at a proper time. The fridge always goes bad when you have temperature-sensitive food in it. The plumbing backfires when you’re sleeping or don’t have quick access to a plumber. 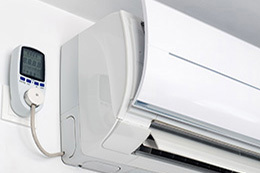 The AC and heating unit tends to go bad in the middle of a hot summer day or a cold winter night. That is why Charlotte AC repair companies exist. We’ll make sure that your unit is working properly and that it will continue to do so for a long time. Having to call someone at 2 in the morning is stressful for us, which is why it’s always better to prepare for a possible breakdown than it is to have to deal with the problem when it happens. That’s why Charlotte AC repair companies offer maintenance services. One maintenance service a year can help keep away future problems – but that’s not all that it can give you. If your AC unit is fussy, having a few Charlotte AC repair businesses do some maintenance on it could be a good way to get a feel for their work ethic and business policies. It will give you some exposure to a few different companies and you may end up picking a favorite, which will make it less stressful on you if your unit breaks down and you need someone to fix it. Finding a repair company last-minute can be difficult if you want the job done right and quickly – so see what your local repair companies have to offer and give them a test-run or two.